Tonilee and I have had the privilege over the past several years to work with and assist numerous organizations in the areas of marketing, business development, social media and branding. Non Profits, especially ministries, have one major common cause…serving the Lord through serving others. After spending some quality time with the executive leadership team at the National Network of Youth Ministries, their levels and networks of service are nothing short of phenomenal. But, you or the average person may not be aware of just how much they have done over the years and how many youth ministries they have either influenced or helped start. You may not even know who they are. It’s time. Our youth workers, leaders, students, parents, and communities across the United States need to know about the National Network of Youth Ministries and how to support them. Personally, I’ve never met such humble, giving men and women who would rather remain in the background, behind the scenes than boasts about their accomplishments. So, I am going to boast on their behalf and encourage you to check them out. They need our support and prayers to keep up their global mission of connecting youth leaders through the most integrated and interactive networking platform that exist today in youth ministry. That’s NNYM…learn more about them, get involved and reach out in support. Visit www.YouthWorkers.net for more information. 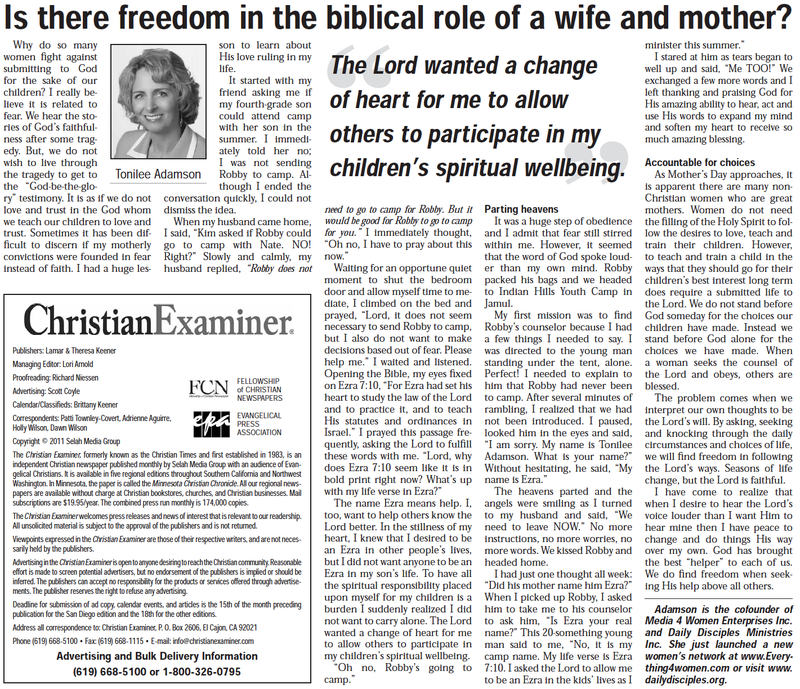 Is there Freedom in the Biblical Role of a Wife and Mother? The more I look around, the more I discover that people are struggling. When there is no margin in our lives, we have no ability to cope with broken cars, crying kids or sick pets. We are crying for more time, better organizational skills and support but if we miraculously had the ability to schedule spare time, how would we fill it? I really believe that people like to be busy. Busyness looks like productivity and it makes us feel needed. But I also believe when we get to the point of accepting God as sovereign, we make time for Him to move in everything and to move us to serve Him anywhere. Keeping Him in perspective gives us the perspective to be absolutely productive and useful in our margin-less lives. It is not about the crises anymore but about how the Lord can move through them to give each thing purpose. The rationalizations, justifications and excuses keep us from growing, developing and making a difference. I want a blessed life. No, I want an abundantly blessed life. But I want that blessed life to be defined by the Lord. Basically I want more of the Lord in every aspect of life, regardless of how He wants to use me and for whom. Our Media Company is growing like crazy and I have people ask me all the time, how do you do it all? If I was not doing all of this, I would certainly be busy with something else but I have learned that I want to be where the Lord is blessing…He is choosing to bless this. I have spent prior days being busy doing shopping, laundry, vacation planning and house decorating. I noticed in that season of life, I spent my energy in the things that were a continued extension of me. I love my family so to be busy with their things kept me loving and serving the things I already love. I do not need to be spirit led or depend on the Lord to love those who love me back. (And, realistically, I always make time to do these things because they naturally have my heart). However, adding a responsibility that helps to serve those outside my heart’s desire has allowed me to grow and love in a completely different way. God is sovereign. He can do what He wants and He can bless whom He wants. Regardless of what others think I need to be doing or who they want me to be, I choose to follow the Lord. Allowing the Lord to have free reign in my overly scheduled day has given me a peace and a joy that has truly bless me. It really did come by reprioritizing the busyness. “Busyness in His Business.” We can remain busy but are we really about His business or our own?